THOUSANDS of patients at doctors’ surgeries in Camden have signed a petition to form a massive rebellion against the use of private companies in the NHS. It is one of the largest local campaigns against the government’s reforms in the country and comes as campaigners are increasingly worried that super-sized “polyclinics” – due to open at the Royal Free and University College London hospitals – will ultimately end up in the hands of private firms. Doctors reported a “huge response” to the controversial proposals, particularly the creation of poly­clinics and the use of private firms such as the American health giant UnitedHealth which recently took over three Camden surgeries. There is a belief that even more patients will want to join the campaign when the plan to bundle GP services and hospital outpatient services under one roof becomes clearer to the public. Candy Udwin, from Keep Camden GPs in the NHS, helped collect more than 300 hundred signatures at a street stall in Camden Road on Saturday. The giant new clinics could mean several fam­ily-run surgeries fall off the medical landscape, particularly in Bloomsbury. Camden Primary Care Trust has already approved the hospitals as potential sites for the polyclinics, and has agreed a bid for a similar project combining the James Wigg practice and Caversham practice, both in Kentish Town. Under the plans, patients would make polyclinics the first port of call for a basic check-up before being referred back to other specialist surgeries somewhere else in Camden. It amounts to the largest change in the way people visit doctors in the area, but some of the biggest objectors fear the changes are being introduced stealthily. Conservative Party leader David Cameron recently met Camden doctors and Chris Philp, the Tories’ parliamentary candidate for Hampstead and Kilburn, to discuss the changes. 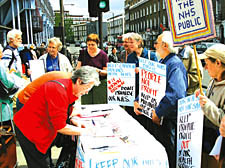 Holborn and St Pancras MP Frank Dobson and his Lib Dem rival Jo Shaw have already put fighting the privatisation of health services at the top of their agendas. Mr Dobson called on the PCT to freeze out any possible contractor with a history of wrong-doing. This was a thinly veiled dig at the way UnitedHealth, whose American arm has been indicted in the United States for insurance fraud, has become involved in Camden. The patients’ petition is part of a nationwide lobby launched by the British Medical Association due to be delivered to Downing Street today (Thursday). The BMA argue patients will lose the link with their family doctor and the elderly will suffer most from having to travel longer distances to see a GP. Advocates of the polyclinic scheme – including health minister Alan Johnson – have this week ignited the debate by arguing that patients should not fear the use of the private sector because GPs’ practices are already run as independent businesses and that doctors are not directly employed by the NHS. Dr Stephen Amiel, a partner at the Caversham Practice and chairman of the Camden branch of the London-wide Medical Committee, said: “That argument makes me really bloody angry. Most GPs do not do private work. “The fact that we are technically independent is an accident of history – the reality of it is GPs regard themselves as the bedrock of the NHS. “We are not accountable to our stakeholders. We are subject to NHS pensions. • Former Health Minister Frank Dobson, Labour MP for Holborn and St Pancras, will speak at a public meeting on the future of the National Health Service at the Caversham Practice on June 25.